We love breakfast. My morning is just not right until I’ve had a good supply of coffee and either oatmeal or Ezekiel bread toasted with homemade jam. I do not understand people who can pop out of bed and move through their day without eating anything. I am one crabby person without breakfast! Since we are up and out of the house by 7, we are also fond of the mid-morning snack. Typically, I make Tom muffins to take to work, but this week I explored new territory with breakfast bars made with oats and dried fruit. We started with a recipe from Clean Eating magazine and changed it up a bit. The original recipe is a bit bland (to us), but good, so we gave it a bit of oomph. Cause a little oomph is what we need at about 10:00 every morning! These bars are easy to make, unbelievably filling, high in fiber and low in fat. You can use any dried fruit combination you like. I like the tartness of the cherries and cranberries, but apple and blueberries would be good, too! If you’re looking for a more decadent breakfast, you could add cocoa nibs or dark chocolate chips. Because dried fruits are very concentrated, this is one area where I really go out and buy organic. Any toxins on the original fruit will be concentrated down along with the fruit pulp and that is not a good thing. Lightly grease a 8″ x 11″ baking pan and set aside. Combine the oats, flour, cinnamon and salt in a large mixing bowl. In a smaller bowl, whisk the eggs and egg whites. Add the applesauce, vanilla, honey and syrup and whisk again. Add the liquid to the oat mixture and mix well. Add the dried fruit and mix again. Pour the oat mixture into the pan and press into place. Top with slivered almonds (I pressed them into the bars a bit) and bake 30 minutes. Let cool in the pan and cut into 16 pieces. These will keep in an airtight container for 3-5 days. I might make these today!!! You know I love breakfast Ohhhh do I love breakfast. And fruit. And oatmeal. And bars/cookies that seem healthy. The original recipe was pretty terrible, but I think these are good! And very filling, which is nice. 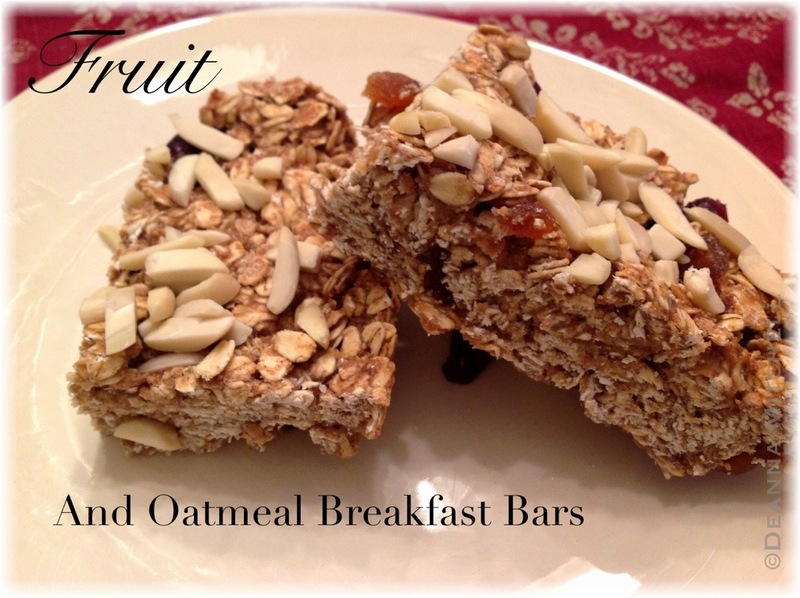 I hate it when I eat a “breakfast bar” and then immediately think “I could eat about 10 of those and not feel full.” Enjoy! It’s a great day to be home baking.